Summer’s almost over but don’t be sad — that means it’s almost time for Mickey’s Not-So-Scary Halloween Party in Walt Disney World’s Magic Kingdom. We’ve got a ton of information on this year’s party, as well as answers to some of the most frequently asked questions. If you’ve got more, please leave them in the comments. Located in Frontierland and seen as part of the “Boo-to-You” Halloween Parade, the Cadaver Dans will take you through rousing renditions of spooky Disney classics like “Grim Grinning Ghosts”, “Cruella DeVil” and the “Oogie Boogie Song” among others. Lead by the Headless Horseman, this eerie but fun parade featuring ghosts and ghouls from the Haunted Mansion takes place twice nightly. Cinderella’s Castle will be magically transformed with Halloween-inspired scenes featuring Disney Villains. Disney Villains and the Ghost Host from the Haunted Mansion welcome guests to a spooky version of the Magic Kingdom’s much-loved evening fireworks display, set to the soundtrack of Disney’s scarier songs. Trick or treating for visitors both young and old. Special Character Meets – These are incredibly popular and lines form early. Available in 2015: Jack Skellington and Sally, the Seven Dwarfs, Jafar, Cruella De Vil, the Queen of Hearts, and Lotso, as well as many other regular characters. The Monstrous Scream-O-Ween Ball and the Toy Story Dance Party are a character dance parties last held in 2014, and are scheduled nightly from 7 PM to Midnight, but no further information has been given as yet. PhotoPass photographers will take Magic Shots during the party. When you look at your pictures, you’ll see something magically inserted into the shot with you… maybe a ghost or two! Download the PDF here. Click on images below for full resolution. 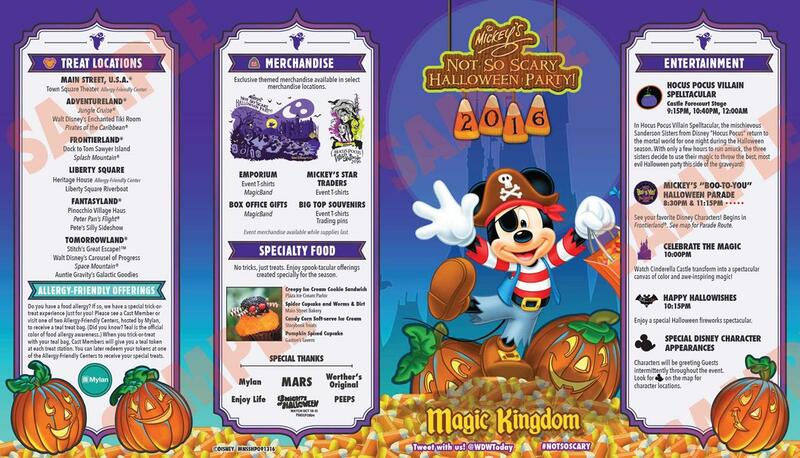 Q: If I purchase a ticket to Mickey’s Not-So-Spooky Halloween Party, do I need to have a Park ticket for the Magic Kingdom for that day as well? A: No. 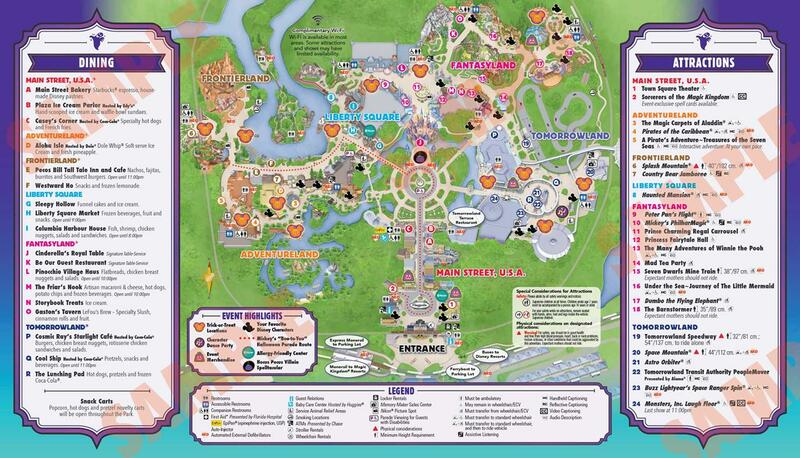 You do not need a park ticket in addition to the special event ticket to attend the Halloween Party, which officially begins at 7 PM — however party guests have traditionally been allowed into the Magic Kingdom starting at 4 PM. Q: Will I be able to make FastPass+ selections for attractions during the Halloween Party? No — there are no FastPass+ selections available during the Party, between 7 PM and Midnight. The good news is, you won’t need them. Ride lines tend to be much shorter during holiday parties because guests are busy with other activities, like special character meet and greets, trick or treating, and the parades. So it’s a great time to ride your favorite attraction an extra time or two. Make sure to visit Haunted Mansion, of course, which is extra spooky this time of year. Q: What is the costume policy for guests at Magic Kingdom and for Mickey’s Not-So-Scary Halloween Party? Can we dress up? A: This is an important question, as Disney has changed their policy regarding costumes recently. Here are the guidelines — note that the rules for guests 14 years and older are stricter than they were in the past. Q: Are the special character meet and greet lines long during the Mickey’s Not-So-Scary Halloween Party? YES. In past years both the Seven Dwarves meet and Jack Skellington & Sally’s in particular had lengthy, lengthy lines. If these character meets are important to you, get there early — as in, before the party starts early. A; Tickets start at $72 for adults and $67 for kids and rise closer to $100 as Halloween nears. Click here for more details, and to purchase tickets now.